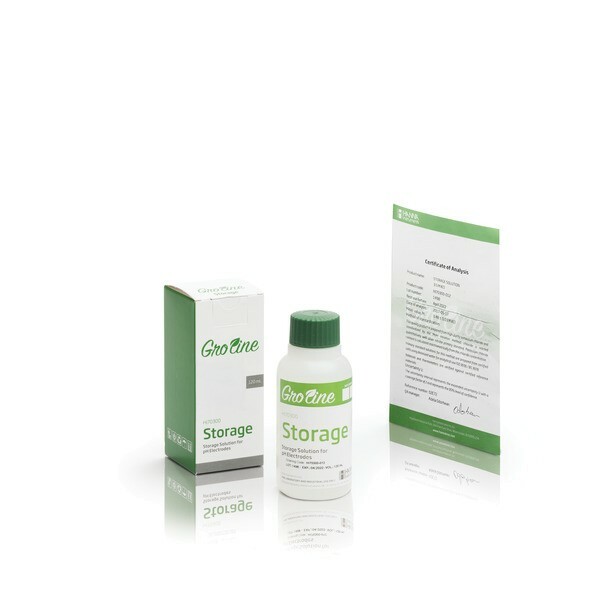 Product information "HI70300-012 GroLine Electrode Storage Solution (120 mL)"
HI70300-012 is a GroLine storage solution prepared with reagent grade chemicals that can be used to ensure optimum performance of your pH and ORP electrodes. It is necessary to store a pH electrode in a solution in order to keep the glass membrane of the pH electrode hydrated. Ideally a storage solution should be used; never store an electrode in distilled or deionized water. The Hanna Instruments storage solution is specifically formulated to minimize microbial growth and to prevent any diffusion/osmotic effects from storing a probe in a solution with the highly concentrated inner reference electrolyte. Storing your pH and/or ORP electrodes in a storage solution will also keep the junction clear. Maintaining the hydrated layer and clear junction will help to ensure a fast and reliable measurement. In the case of cleaning your pH electrode in one of our cleaning solutions, we recommend soaking the electrode in the HI70300-012 GroLine storage solution for at least one hour before taking measurements. HI70300-012 is a GroLine storage solution that can be used to store your pH electrode*. To ensure an optimum response time, the glass sensor tip and the reference junction of the pH electrode should be kept moist and not be allowed to dry out when not in use. Placing the electrode in a small glass filled with storage solution or replacing the solution in the protective cap is a suitable way to store the electrode. The HI70300-012 should also be used to rehydrate the electrode after a cleaning procedure by soaking for at least one hour before taking measurements. Related links to "HI70300-012 GroLine Electrode Storage Solution (120 mL)"
Customer evaluation for "HI70300-012 GroLine Electrode Storage Solution (120 mL)"